Amina has been working for the Eve Branson Foundation since 2006. She lives with her husband and three children in Tamgounssi and teaches embroidery, sewing and rug-making, providing her specialist skills in traditional crafts. Having been given the opportunity to study tailoring and embroidery after she left school, Amina is very keen to pass these skills on to the next generation – both through her teaching programmes and artistic workshops. Amina has devoted the past 10 years to teaching young women how to create high quality textile products in the villages of Tamgounssi, Tifaouine and Tiwizi. She recently managed the delivery of a very large order of napkins and tablecloths for the US Ambassador in Rabat, and regular commissions from retail partner Mushmina. Thanks to Amina’s hard work, two of her embroidery students were able to buy new equipment for their homes with the income earned. Amina is now in charge of running teaching programmes at the brand new weaving centre in Tamgounssi, training over 40 local women. 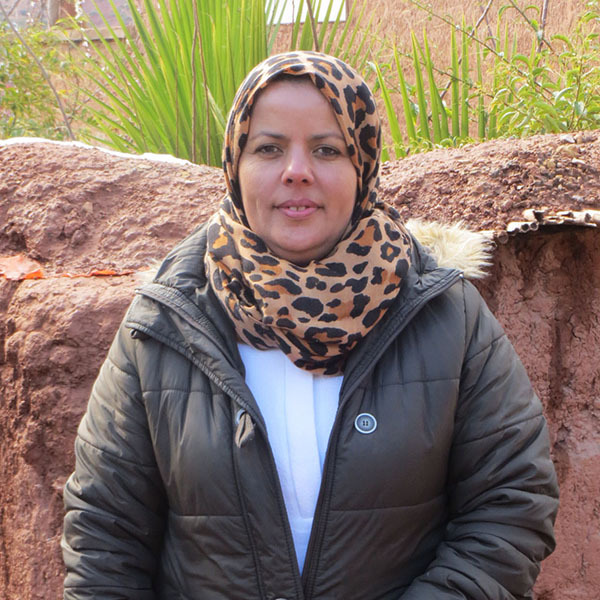 She is very proud of the accomplishments of her students and has seen two girls successfully find employment – one through dressmaking and working in a jeans factory in Marrakech, while another has created her own boutique selling hand-sewn djellabas. She has also secured funding in her local community to build and maintain a local crèche. This will enable more women to seek and attend work. Amina is always willing to try out new designs and created camel baby blankets and children’s aprons to sell in the Eve Branson Foundation Shop. She has become a role model for others who are eager to learn and perhaps one day, will become self-employed.